Baking. I know, you know. So let's not go over this again. 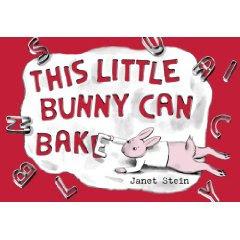 So I was admittedly nervous when I first saw This Little Bunny Can Bake by Janet Stein at a Random House preview. "Oh, it's another baking book," I said to myself. I think I've talked about this before, but I feel like baking can be overdone with kids - it's that whole preciousness thing: cupcakes in cute paper cups, cookies cut into cutesy shapes, gingerbread houses. You know what I'm talking about. So I expected this book to give me a cavity. Not the case here. I credit Stein's stellar artwork: the limited palette gives it a modern, graphic feel. It's minimalist but still visually interesting. The art is done in brush and ink, all in varying tones of blacks, whites, and grays. Bunny is pink. The doors to "Chef George's School of Dessertology" have bright red stars on them. The text is red. Bunny's cake has pink icing. The cover is fantastic - it's bright with lots of appeal and sure to catch a child's attention when placed face-out. The text is brief enough for storytimes with the pre-K set, but older kids will see all kinds of hilarious details: all the books recommended by Chef George are actually written by Chef George and the spoonbill (haha!) is stirring bugs and fish into his batter. In the midst of all the baking, Chef George is teaching them about teamwork, cleanliness, concentration, and - of course - presentation! To top it off, the endpapers have recipes which, unfortunately, will probably get cut off a bit by library processing. On the upside, the recipe for "C.G. 's Chocolate Salami" will probably escape unscathed, which is a good thing because even I am tempted to try it! It should be noted that Janet Stein studied art in the U.S. and studied food in Barcelona with an award-winning chef. It shows. Eat, drink, and study at the School of Dessertology! Oh, the baking! My eyes, my eyes! Nothing says "I love you" like beef.